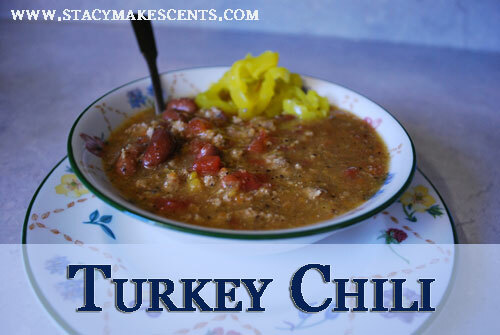 The second recipe I’m showcasing from the cookbook Deceptively Delicious is Turkey Chili. Please don’t run screaming from the room. I realize that a lot of people think that ground turkey is really gross – we are not among them. 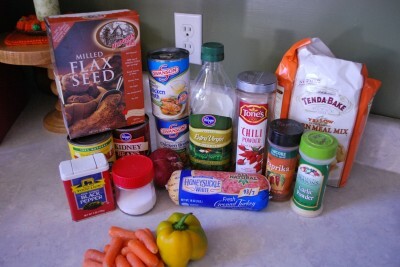 I use ground turkey a lot in our house…..especially when I find it marked down. My friend Kim will NOT use ground turkey because she tried it once and her family had nightmares for months. I keep telling her it was a loooooooooooooong time ago and she should try it again. Ground turkey has come a long way. It’s a great substitute for beef and pretty healthy to boot! However, if ground turkey makes you gag and fall down on the floor and have convulsions, then you can substitute ground beef. The verdict for this recipe? Not bad. I liked the finely chopped vegetables and the addition of cornmeal. 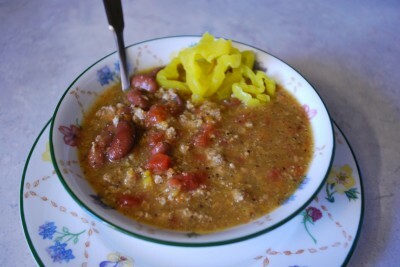 Now ,it’s not the BEST recipe for chili I’ve ever had, but it’s great for sneaking in vegetables and getting your kids to eat healthy. Even my mom liked it and she’s really picky about her chili. So, let’s be sneaky shall we? 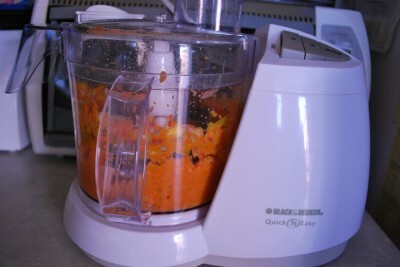 You need carrots, sweet pepper, flax seed, canned tomatoes, kidney beans, red onion, salt, pepper, chicken broth, olive oil, chili powder, ground turkey, paprika, garlic powder, and cornmeal. If you don’t have flax, you can leave it out…..but it gives a nice, different flavor. I didn’t go exactly by the same steps. Don’t turn me in. The recipe at the bottom will be the exact recipe from the cookbook. The secret ingredient here? Carrots and peppers. The recipe calls to puree these, but it also says you can just chop them really finely. I stuck mine in the food processor and blended until they looked like paste. It saved a lot of time. Oh, I also stuck my onion in there. The recipe says to just chop those, but I went ahead and blended them with my other veggies. I’m sneaky like that. Coat your soup pot with cooking spray and then add some olive oil. Sautee the veggies until they’re no longer crunchy. If your chili is crunchy, you’ve done something very wrong. Go to Wendy’s…….unless you hate fingers in your chili. 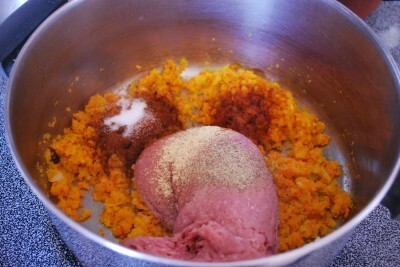 Put your ground turkey in the pot, along with your paprika, chili powder, garlic powder, salt, and pepper. Yes, ground turkey looks sorta weird. Like ground beef without a tan. I’m very white too – maybe that’s why I like ground turkey. If you tan, you might not like this recipe. Brown the meat with the veggies, until all the pink is gone. It won’t take long, maybe 5 minutes or so…..so don’t run off to watch TV or anything. However, if you need to run after your daughter because she’s taken off with your cell phone that’s okay. 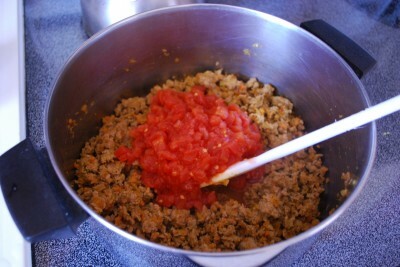 When your meat is brown, stir in your can of tomatoes. You don’t want to drain them first because we want the juice. 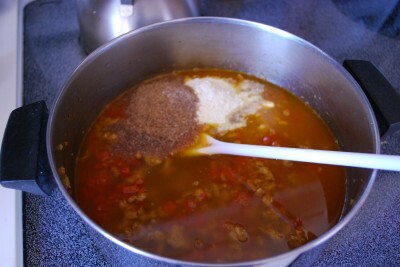 Add the canned broth, cornmeal, and flax seed. Stir well to incorporate. Bring the soup to a boil. When this pot boils, it dances. It’s really weird. It shakes it’s booty from side to side. I keep it around for the entertainment value. 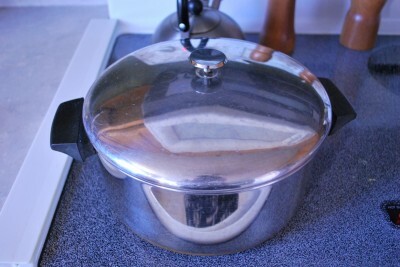 When it boils, reduce the heat and put the lid on. Let it simmer for about 20 minutes to let the flavors mingle. I love mingling….it’s my favorite part of a party; well, except for the cream puffs. 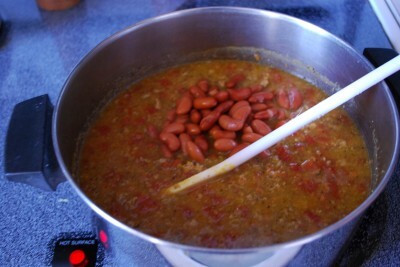 You need to drain your can of beans; if you don’t it will make your chili look muddy. Ew. 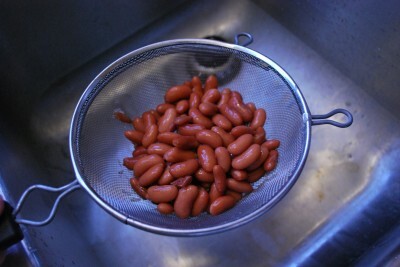 Oh, and supposedly draining the beans gets rid of the gas. Do you really believe that? You can dump your beans in after the 20 minute simmer. Now, if your kids hate beans and eating them is against their religion you can puree or mash them before you stir them in. They’ll blend right in and the kids will never know. Sneaky! Annie loves beans, and so do we, so I left them whole. You’ll leave the soup on the stove just long enough to warm the beans. I took mine off and added the beans because I knew the soup was hot enough to do the job for me. We like hot food. If your nose isn’t running, it’s not hot enough. So, this wasn’t exactly hot enough for us. I added hot peppers to our bowls and it was just right. 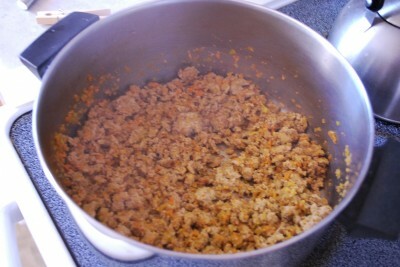 If you’re a pansy, then this is the recipe for you.See, ground turkey isn’t that bad. Try some. You too Kim! Coat the bottom of a large pot with cooking spray and set it over medium heat. When the pot is hot, add the olive oil. Add the onion and cook until it begins to soften, about 2 minutes. Meanwhile, sprinkle the turkey with garlic, chili powder, salt, paprika, and pepper. Add the turkey to the pot and cook, stirring occasionally until the turkey is no longer pink, 5-6 minutes. Stir in the tomatoes. 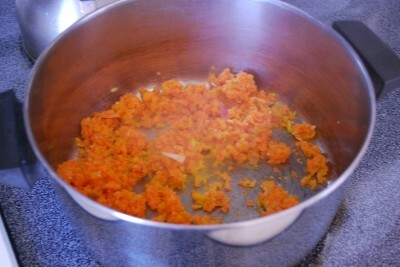 Add the broth, pepper puree, carrot puree, cornmeal, and flax seed. Stir well. 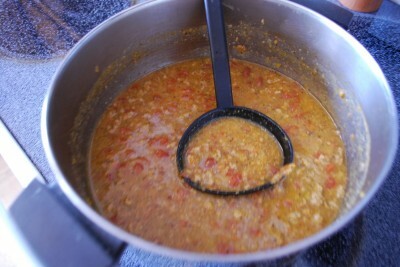 Bring to a boil, reduce the heat, and simmer, covered, 15-20 minutes or until the flavors have blended. Stir in the beans and cook a little longer, just to heat through.